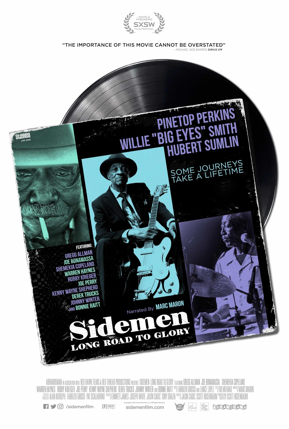 Scott Rosenbaum’s SIDEMEN is in its way a glorious celebration of legends Pinetop Perkins, Willie ‘Big Eyes’ Smith, and Hubert Sumlin who backed up blues legends such as Howlin Wolf and Muddy Waters . It’s a wonderful at the men, their lives and especially their music. The film begins with a look at the conditions that drove the men out of the deep south of America north toward cities like Chicago where they could earn a living playing blues. From there the film spirals out to show us the lives of the men, their work with blues headliners and finally the legacy of all three (they all passed away within 8 months of each other in 2011). It’s an awesome tale full of good people and great music and it will fill you with a desire to track down all of the recordings that the worked on and add them to you collections. However as much as I love the film I was struck by two things that have kept me from calling this one of the best docs I’ve seen this year. The first is that for as game changing as the trio is the film is rather conventional. It’s the typical mix of clips and talking heads. There is nothing wrong with it, but for a trio of men who changed music one would have done more. The other thing that kind of bothered me was that the film is only about 80 minutes. It’s much too short. Granted what is here is choice, but I wanted more. There has to be more music and more talk. Perhaps on the DVD or Bluray…. Quibbles aside this is a super film and a must for any blues fan or fan of any sort of music.